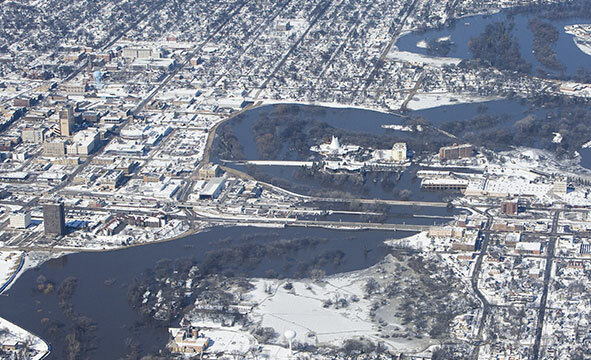 St. Paul, Minn. — The Minnesota Department of Natural Resources (DNR) released its draft supplemental environmental impact statement (Draft SEIS) describing the potential environmental and social effects of the revised Fargo-Moorhead flood diversion project, known as Plan B. The Draft SEIS, and additional details about the proposed project and the DNR’s review process are available at www.dnr.state.mn.us/input/environmentalreview/fm_flood_risk/index.html. The DNR invites comments on the Draft SEIS until 4:30 p.m. Sept. 27. The document describes Plan B, identifies potential environmental impacts and considers mitigation that may lessen harmful impacts of the revised project. The supplemental review focuses on those aspects of the revised project that were not evaluated in the original environmental impact statement (EIS). The DNR denied the Fargo-Moorhead Diversion Authority’s previous permit application in October 2016. Reasons for that denial included insufficient mitigation of project impacts and inconsistency with state and local plans. Following the DNR’s permit denial, North Dakota Gov. Doug Burgum and Minnesota Gov. Mark Dayton created a joint task force to develop engineering options to address concerns about the project’s impacts. The Diversion Authority considered the task force’s work in developing the current project proposal. DNR Commissioner Tom Landwehr said changes to the original proposal require additional analysis. He said the DNR’s Draft SEIS is entirely separate from the agency’s ultimate decision about whether to approve the permit application. The SEIS will help ensure that the potential impacts of the project, as revised, are thoroughly assessed and disclosed, he said. “I want to emphasize that Minnesota continues to support enhanced flood risk management for the developed portion of the Fargo-Moorhead area that can meet Minnesota state standards,” Landwehr said. The DNR is conducting the supplemental environmental review concurrently with its consideration of the Diversion Authority’s permit application for its project. However, as required by state law, the DNR will not decide on the permit application until the supplemental environmental review process is complete. The SEIS adequacy determination is not a project approval but is rather an administrative decision about whether the supplemental review process was completed properly. The DNR is expected to complete the SEIS and adequacy determination by the winter of 2018. A permit decision is expected soon thereafter. The U.S. Army Corps of Engineers is preparing a federal supplemental environmental assessment for the proposed project, which is similar to the state SEIS in scope and purpose.